The document is 90 pages long. This literature review has two purposes. 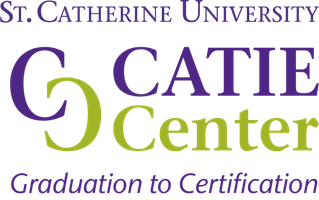 First, it serves as the basis for development of an experiential learning graduation-to-certification program for American Sign Language (ASL) interpreters through both face-to-face and virtual environments. 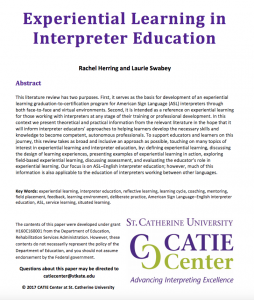 Second, it is intended as a reference on experiential learning for those working with interpreters at any stage of their training or professional development. In this context we present theoretical and practical information from the relevant literature in the hope that it will inform interpreter educators’ approaches to helping learners develop the necessary skills and knowledge to become competent, autonomous professionals. To support educators and learners on this journey, this review takes as broad and inclusive an approach as possible, touching on many topics of interest in experiential learning and interpreter education, by: defining experiential learning, discussing the design of learning experiences, presenting examples of experiential learning in action, exploring field-based experiential learning, discussing assessment, and evaluating the educator’s role in experiential learning. Our focus is on ASL-English interpreter education; however, much of this information is also applicable to the education of interpreters working between other languages. experiential learning, interpreter education, reflective learning, learning cycle, coaching, mentoring, field placement, feedback, learning environment, deliberate practice, American Sign Language–English interpreter education, ASL, service learning, situated learning. The contents of this video and paper were developed under grant H160C160001 from the Department of Education, Rehabilitation Services Administration. However, these contents do not necessarily represent the policy of the Department of Education, and you should not assume endorsement by the Federal government.